The installation consists of a wooden display case in the shape of a Jewish gravestone or Tabernacle (see footnote) in which three objects are displayed, sealed by an acrylic cover. The first object is a leather desk folder with a section of Adolph Hitler’s clock embedded into it with the words ‘Hitler’s Berghof Berchtesgarten 1945’. 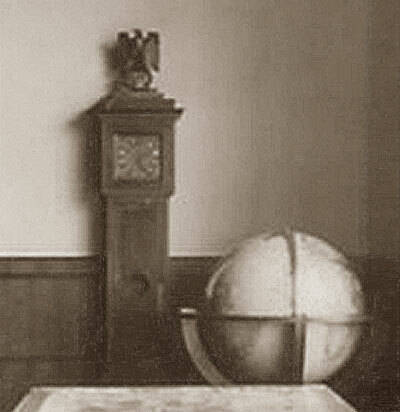 The brass clock had been made specifically for Hitler and was located in his mountain retreat residence (Berghof), in the main reception room next to the famous picture window which could be lowered and raised to show views of the mountains. The mountain retreat was entirely destroyed by allied bombing in 1945 and this piece of the clock that still exists clearly shows fire damage. Today there is nothing visibly left of Berchtesgarten. “ A friendly remembrance” and below that the signature of his SA Adjutant Willhelm Bruckner. The guest book was from a mediaeval monastery in Maulbronn. The third object is the map that was supplied to the invading American troops, showing the layout of Hitler’s mountain retreat and the location of the various buildings. The printed paper has been properly preserved by a paper conservator, whilst maintaining its antique appearance. Next to the main piece is a framed display containing an sworn affadavit from 1956, by the lieutenant who accompanied my father at Berchtesgarten, proving the genuine provenance of the pieces. It also includes a postcard example of Hitler's signature and a photo detail of the original clock in situ at Berghof. My father was part of the investigating team of the US war crimes unit in Germany in 1945 and visited Berchtesgarten shortly after its destruction by the bombing and liberation by US troops. Whilst touring the location in the vicinity of Hitler’s reception room, he found the piece of the brass clock. It was later mounted into a leather folder by a captured SS officer who was under investigation by my father and who had also been a saddler before the war. The signature from Maulbronn was retrieved by my father during an investigation. The map is the actual one he was given in 1945 during the liberation of Berchgtesgarten, as a member of the invasion force. These things were always displayed on my father’s desk in his study during my childhood and had a deep emotional effect on me. By containing them in a Jewish tabernacle, the work takes on a much deeper significance. It could pertain to the final triumphant victory over the evil of Hitler. It could pertain to a final forgiveness of the evil that took hold of a nation and killed at least 60 million people. It touches on the contradictions that still exist over what took place during the 1930’s and 40’s and the final destruction of Hitler’s reich. The Tabernacle (Hebrew: mishkan,"residence" or "dwelling place"), according to the Hebrew Torah Old Testament, was the portable dwelling place for the divine presence from the time of the Exodus from Egypt through the conquering of the land of Canaan. Built to specifications revealed byYahweh (God) to Moses at Mount Sinai, it accompanied the Israelites on their wanderings in the wilderness and their conquest of the Promised Land, and was eventually placed in the First Temple in Jerusalem, which superseded it as the dwelling-place of God among the Israelites. It is not mentioned after the destruction of Jerusalem by the Babylonians. The fullest description of the Tabernacle describes an inner shrine named Kodesh Hakodashim (Holy of Holies) housing the Ark and an outer chamber (Holy Place), with a golden lampstand, table for showbread, and altar of incense. According to the 19th century "Higher Criticism" school of Julius Wellhausen, an earlier, pre-exilic source describes the Tabernacle as a simple tent-sanctuary.